It was about a year ago that Ringling Bros. And Barnum & Bailey Circus announced it would retire all Asian elephants from its traveling shows by 2018. 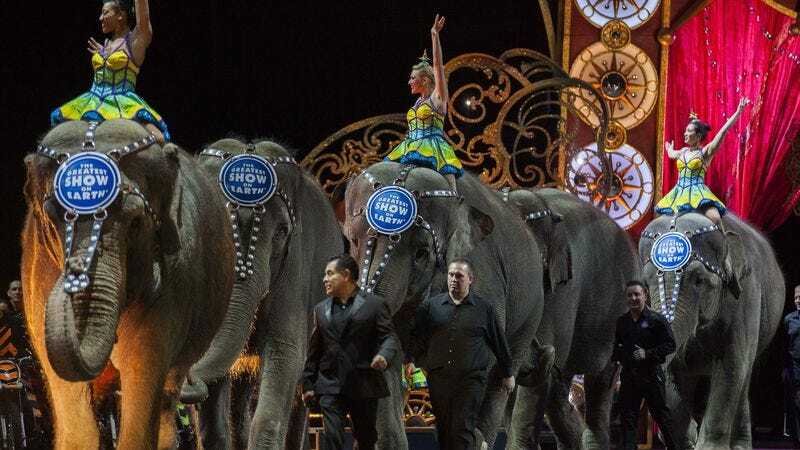 The decision was prompted in part by increased scrutiny of the circus group’s treatment of its elephants following the release of the HBO documentary, An Apology To Elephants, which brought to highlighted the animals’ intelligence and also shed some light on the substandard living conditions they’ve endured. Of course, animal rights activists have been calling out the circus group for years on its treatment of the elephants, including harsh training practices that could lead to psychosis. It also became increasingly difficult for Ringling Bros. And Barnum & Bailey Circus to tour with the elephants as many cities and counties have passed “anti-circus” and “anti-elephant” (performances, we’re assuming) ordinances. At the time, Ringling Bros. And Barnum & Bailey Circus said that eventually all 13 of its elephants would be moved to its very own Center for Elephant Conservation, but did not give a hard start-date for the phasing out. But according to The Hollywood Reporter, the elephants will retire to Florida sooner than originally anticipated. It seems that while working out the details of their plan, the circus group realized that it could move the 11 elephants that are still performing to its conservation center as early as May 2016. Feld Entertainment, which owns Ringling Bros. And Barnum & Bailey Circus, also owns the largest herd of Asian elephants in the U.S., as well the Center For Elephant Conservation. Alana Feld, Ringling’s executive vice president and show producer, said the retired elephants will be a part of the cancer research that’s conducted at the conservation center, which we’re currently cautiously optimistic about being a more comfortable, humane setting for them.